Kenyan online and SMS-based recruitment platform Duma Works has announced the launch of an affordable hiring and employment package specifically catering to local agribusinesses. Citing the fact that the agricultural sector in Kenya is a key contributor to the country's economy and accounts for 60 per cent of total employment, Duma Works said the majority of this economy - around 80 per cent of it is not formalized and thus excluded from professional hiring services and employment agencies. This realisation prompted the move by Duma Works to offer low-cost recruitment services to the agricultural sector, with the company offering agribusinesses a 40 per cent discount per hire on Duma Works' basic plan, and a 60 per cent discount on its advanced plan. For its expansion into the agriculture sector, Duma Works has partnered with Agri Experience, and is sponsored by Kenya Markets Trust. "This effort began with a mutual desire to ensure employers in the agriculture and seed sector have access to the tools they need to hire the right human capital and grow their businesses," said Arielle Sandor, founder of Duma Works. "Agribusinesses are significant drivers of the Kenyan economy and it's critically important to give them the staffing support they need to thrive." The partners said their goal is to develop more specialised expertise in the agriculture sector, and better support for employers and potential employees. Ultimately, the partnership aims to encourage the ongoing expansion of employment opportunities in small rural agribusiness. "These small rural agribusinesses across Kenya are the lifeline for farmers, and as Kenya's agriculture sector grows, they need to be staffed by employees who understand customer service and have a deep knowledge of the seeds and other inputs farmers need," said Aline O'Connor of Agri Experience. "Our hope is that our partnership with Duma Works will lead to staff that are well-suited for a career in rural agribusiness - one that will translate into better performance for the business itself and for Kenya's farmers." 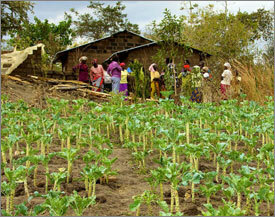 Agribusinesses in rural Kenya trying to hire, should call +254 702 093 793 to sign up for the service. Job seekers in the agricultural sector can sign up by sending an SMS with the word "AGRICULTURE" to 22131.